There are many “Alaskas”. The large state is renowned for its dry, cold interior and also for its coastal regions. The coast itself varies from tundra to temperate rainforest and is full of a birds and marine mammals. In the Kenai Penninsula, large tide water glaciers add icebergs to the water which are used by pupping harbor seal mothers for rest. The region is known for its rising peaks which jut from the ocean as snow-capped mountains. On the sunny, late June day, that we departed Seward harbor the sun shone on islands and mountains around us. 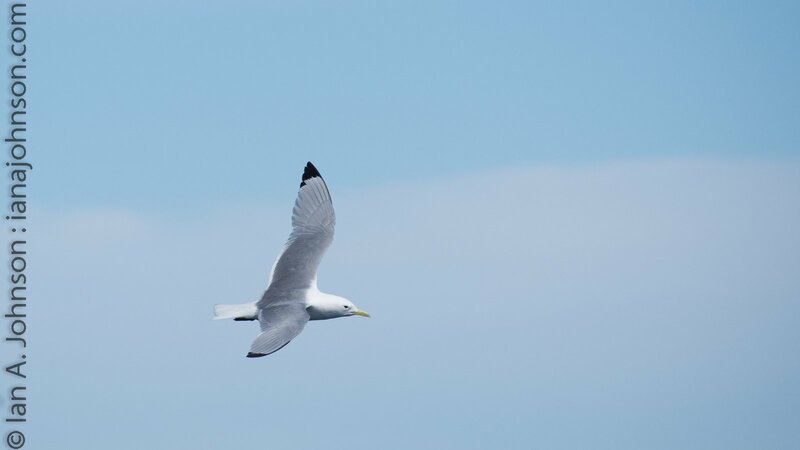 In every direction, gulls and black-legged kittiwakes wheeled and dove over the open ocean.Our 9-hour tour through Major Marine Tours to the Northwestern Glacier and Chiswell Islands had just begun. Once in the open water past the Kenai Peninsula your feet are floating above the largest stretch of open ocean in the world – stretching thousands of miles to Antarctica. Kassie and I had birds on the brain and our small 30 passenger ship (in comparison to some of the 200 passenger ships) was perfect for the trip we were hoping to have. The waters of the Kenai Peninsula is home to many sea (also called pelagic) birds. These birds are remarkable in that the majority of them only come to land to nest, all other times- including the brutally cold winters- are spent at sea on the water. The bodies of many pelagic birds are so tuned to sea-life that they often look awkward on the land. However, their graceful, powerful ability to swim and catch fish makes up for their awkwardness. I’ll just spoil the conclusion, by saying we had an incredible day on the water! This video highlights some of the power of calving glaciers, the beauty of sea-birds and the behaviors of marine mammals. The vertical cliffs Chiswell Islands are perfect for nesting sea birds. Horned Puffins and Tufted Puffins burrow into the cracks to escape predating gulls. Parents are mated for life and separate during the winter, however find each other for every breeding season. Each of the puffin species found around the Kenai coast have extraordinary features. Horned puffins have a dark check-mark patch through through their eye which makes them look as though they have applied makeup to preform at a circus. Part of this check-mark is a horned protrusion comes off each eye like a fancy eyelash. Tufted puffins, the largest of the three puffin species, have large golden ‘eyebrows’ which waggle back and forth when they turn their head. Puffins are recognized by their large bills which they use to catch fish. Both of the pacific puffin species only have orange and cream colored bills, where the Atlantic Puffin’s bill includes blue and red. Puffins can dive up 200 feet beneath the ocean’s surface and they can hold their breath for a minute or two. However Puffins typically only need to stay under for 20 to 30 seconds at a time to catch the small fish that compose their diet. 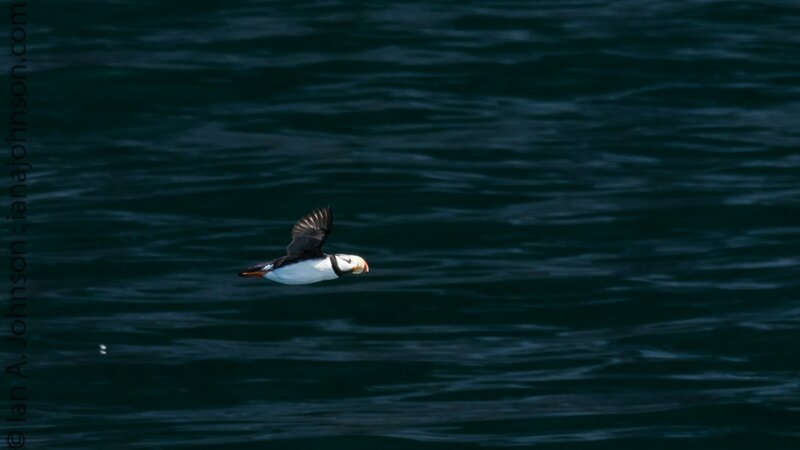 A Horned Puffin flying around the Chiswell Islands. Horned Puffin photographed at the Alaska SeaLife Center. Pelagic birds are often found in large breeding colonies located on islands. For this reason they are referred to as ‘colonial nesting birds.’ These islands provide refuge from land-based predators and the large numbers of birds act as sentries, mobbing any intruder which gets too close. Our Captain informed us that once they had spotted a Black Bear on an island that was a mile from shore. It feed on bird eggs for a couple weeks then swam back to shore. It was a very rare occurrence but it is easy to see how one large predator can decimate the nesting success rates on the island. Black-legged Kittiwakes nest in large colonies in the Chiswell Islands. Our bird list added many ‘lifers’ to our life-lists (along with a couple we had already seen) and many photographs to my hard drive. 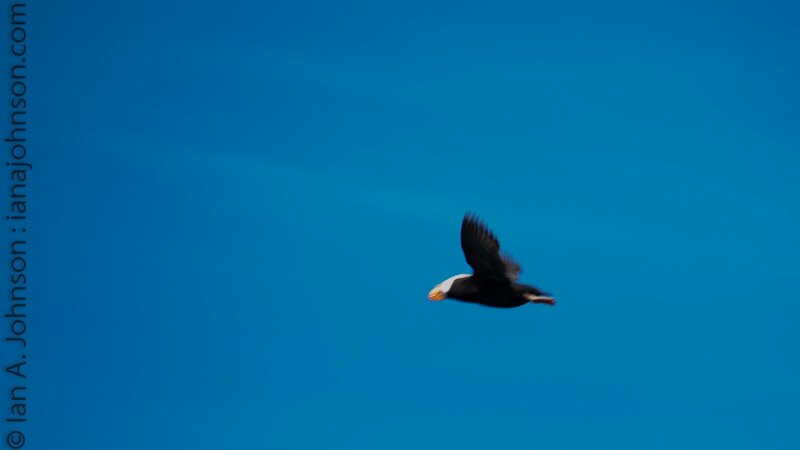 Our list for the day was comprised of Bald Eagles, Rhinoceros Auklets, Horned Puffins, Tufted Puffins, Parakeet Auklets, Pigeon Guillemonts, Common Murre, Pelagic Cormorant, Double-crested Cormorant, Marbled Murrelet, Black-legged Kittiwake, Mew Gull, Glaucous-winged Gull, and a possible Ancient Murrelet. Rhinoceros Auklet photographed at the Alaska SeaLife Center. These birds develop their ‘rhinoceros horn’ during the breeding season, and lose it each fall. There several species of whales and porpoises in the rich waters of the many estuaries of the Kenai. Sea Otters feed on clams, urchins, and other invertebrates that tend to feed on kelp. The Sea Otter is a keystone species that helps to protect the kelp beds providing shelter for a plethora of other sea creatures. Doll Porpoises, Humpback Whales, Fin Whales and Orcas cruise through the waters. The Fin Whales were a rare occurrence for the tour, our guides said they maybe see a Fin Whale 20 times a summer. Our tour saw a very rare pod of at least 6 Fin Whales surfacing together, which meant they were most likely rounding up bait fish instead of filter-feeding. On the rocks, 1 ton Stellar Sea Lion males watch over their harem of females, and the ice flows at glacier heads provide rest for harbor seal mothers and their pups. We saw several pods of Doll Porpoises throughout the day, on the way back to the harbor we had a small pod that decided to race in our wake. One of the highlights of the trip was observing a “lunge feeding” humpback whale with her calf. Lunge feeding is when a whale dives far below a school of food (krill or small fish). Then, rushing to the surface with their mouth open the burst through to the open air swallowing anything in their mouth! This Humpback Whale is headed back down for some more food. A Sea Otter floats on its back displaying its classic behavior. They float along and crack urchins on their chests. They spend their whole lives in the ocean, even giving birth in the water. If seen on land it is typically a sign that the animal is sick. Harbor Seal mothers rest themselves and their pups on ice flows which have broken away from the tide-water glaciers. Stellar Sea Lion males control and mate with many females called a harem. Male Sea Lions can be up to 2,000 pounds! The Harding Ice Field is the largest ice field in the United States and is the source of dozens of glaciers. Some of the glaciers reach all the way down to the ocean and are classified as ‘tide water’ glaciers. These glaciers are constantly being eroded by the oceans daily movements and some of the glaciers have receded miles since the 1800’s when the Russians were exploring the coasts. The receding glaciers open up habitat for mammals and birds. The Northwestern Glacier that we sat in front of stretched for a half mile across the blue fjord, but you would never guess its size by just looking at it! One can get a true sense of power of the tide-water glaciers by watching them ‘calf’. From time-to-time sheets of ice would break away from the exposed glacier face and cascade into the ocean. Even though our boat was positioned 1/4 of a mile away the rush of sound from the huge chunks of ice sounded like a jet engine rumbling in the not to far-off distance. The craggy moraine of the Northwestern Glacier ending at the tideline. Another boat sits in front of the glacier for a bit of perspective. If the boat floated at the front of the glacier it would be a mere speck on the its moraine. The Northwestern Glacier reaches about 1/2 mile from side to side. It’s split into two ‘lobes’ by a rock face. This river of ice and snow is the result of a large chunk of ice which broke away hundreds of feet above. The ice-chute that it slid down poured snow and ice chunks into the ocean. If you’ve made it this far I’d like to put in a quick pitch (unsolicited) for the Major Marine Tour company. Their boat the Viewfinder was piloted by a great captain and the tour guide on board was great with kids and had all the answers. The small size of the boat and number of passengers was perfect for us. They were more than happy to concentrate on birds when we told them what we were after. It was an extraordinary day. Secondly, I would like to put in another unsolicited pitch for the Alaska Sea Life Center in Seward. Their exhibits are truly top-notch, and the chance to experience the pelagic sea-birds up close was wonderful. On top of that, proceeds go towards outreach and science. I am not normally a “zoo type” person, but everything I saw there impressed me to no end!